Foot and ankle tendonitis is a common cause of foot pain. Tendonitis occurs when there is inflammation or irritation of the tendons, which is usually due to overuse from repetitive movements or stretching, or an injury such as an ankle sprain. Symptoms of foot tendonitis typically consist of pain, swelling and stiffness. It usually takes two to three months to recover from tendonitis, but it can take much longer without the proper treatment so early diagnosis and treatment is essential. Foot and ankle tendonitis can affect any of the tendons in the foot. Here we will look at how tendons get damaged and what the effects of that damage is. We will then go on to look at the most common types of foot and ankle tendonitis including the symptoms and treatment options for each. Tendons are the strong, cord-like bands of connective tissue that link muscles to bone. There are lots of different tendons around the foot that work hard whenever we are on our feet. If a tendon is made to work too hard, for too long or in the wrong way, damage and tiny tears develop in the tendon. This is accompanied by inflammation which is the tell-tale sign of the condition. The body’s normal response to an injury is to send extra red blood cells carrying the oxygen and nutrients required for healing and white cells to fight off possible infection. Waste products such as inflammatory chemicals are then carried away. All of this helps speed up healing but should only last for a few days. If an area is repeatedly irritated, the process keeps going resulting in the continued inflammation described as tendonitis. Foot Pain: Pain is usually the first sign that there is a problem. There tends to be a sharp and/or burning pain, usually localised to the area of the tendon at first but as the condition worsens, can spread wider. Swelling: It usually takes a while for swelling to develop with the condition. After a few weeks of minor symptoms, you may notice a soft lump forming over the tendon, which is often tender to touch. 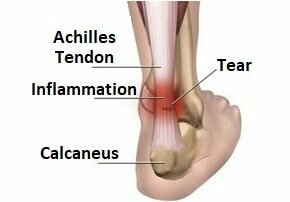 This is most common in Achilles Tendonitis. 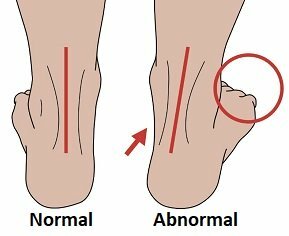 Abnormal Foot Shape: Flat feet are often the result of a problem with the tibialis posterior. The tendon provides a majority of the support and stability for the inner foot arch. Stiffness: The foot and ankle often becomes stiff as a result of ankle tendonitis limiting the amount of pain-free movement. Tendonitis can occur in a number of places around the foot and each will present with different symptoms. This causes heel and calf pain and is probably the most well known type of foot tendonitis. The Achilles tendon joins the two calf muscles to the heel. Pain is usually felt when walking/running and can occur anywhere from the back of the heel up to the middle of the calf. 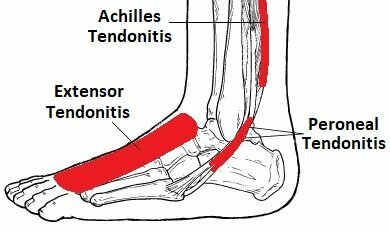 Find out more in the achilles tendonitis section. This causes pain on the back and outer side of your ankle/foot. 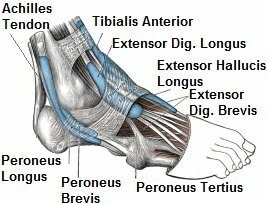 The peroneal tendons run down the outer side of the ankle across the bottom of the foot. Pain from peroneal tendonitis is usually felt when standing or pushing off through your foot. You can find out more in the peroneal tendonitis section. This causes pain on the inner side of the foot. The posterior tibial tendon runs along the inside of the foot and ankle. Pain is usually felt when you start to push off through your foot. Over time, the foot arch will gradually collapse resulting in flat feet. The classic sign of posterior tibial tendonitis is an inability to stand on tiptoes. Find out more in the posterior tibial tendonitis section. This causes pain on the top of the foot. The extensor tendons pull the toes up. Pain from extensor tendonitis is often worse when running. This is one of the more rare types of ankle tendonitis. You can find out loads more in the extensor tendonitis section. This results in pain at the front of your foot. The Anterior Tibial Tendon controls the movement at the front of your foot. Pain is usually felt when coming down stairs or when walking/running on sloped surfaces e.g. hills. Again, this is one of the less common places to get the condition. There are two aims of treatment for ankle tendonitis. The first is to reduce the pain, swelling and dysfunction associated with the problem. The second is to address any aggravating factors that can be avoided to prevent the problem from returning such as abnormal foot shapes or muscle weakness and tightness. With any type of ankle tendonitis, it is vital to rest the foot to prevent further damage and to allow recovery. Any activity that increases pain should be avoided if possible. PRICE principles should be followed (protect, rest, ice, compression and elevation) and anti-inflammatory medication may help. Recovery from any type of foot and ankle tendonitis tends to be slow and can take anything from weeks to months. The earlier treatment is started, the better the likely outcome. For more in-depth information and specific treatment advice for each type of tendonitis, visit the appropriate section choosing from Achilles Tendonitis, Peroneal Tendonitis, Posterior Tibial Tendonitis or Extensor Tendonitis.